College Theme is the latest classic free WordPress theme by Performancing. The theme is a simple, straightforward two-column theme, with the sidebar situated to the left and the main content column at the right. College Theme is easy on the eyes, featuring soft shades and hues of blue. The rounded corners add to the visual appeal–each box on the sidebar, footer and main content have rounded corners for a softer feel. The sidebar boxes come in three gradients: dark, medium and light, to help differentiate the list content. The theme requires the Most Commented, Recent Comments and Recent Posts plugins by mtdewvirus.com, which are included in the ZIP file for download. 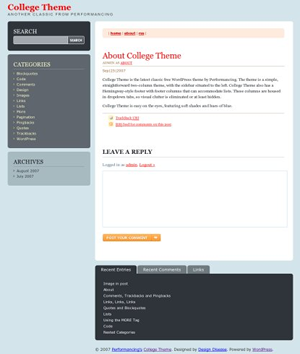 Update: College Theme has been updated for compatibility with WordPress 2.7 and up. Download the latest version here. Click here for a live preview of the College Theme. Click here for WordPress theme support. ⟵So, What Exactly is a Lot of Traffic? Themes are also big factors when it comes to websites. A lot of people move to the next site if the theme you have is too complicated or not great to look at. This one is good.